D7500 or D3200 for Travel? If there is a chance of the D 7500 being stolen, you might think about taking the D 3200. Also you might think about insurance..
Great picture's Johnny and I liked the saying's to..
Are those your Boot's ? How was this created? 2nd try. Thanks for your service to our Great Country !!!! 50mm prime for Nikon D3300. AF Nikkor 50mm f/1.8 D. Very good lens, will work on film Nikons as a standard "nifty fifty" and should be fine on your D3300 Crop Sensor camera as a "short" telephoto or portait lens. Your right,, the D 3300 has no AF motor and it will have to be focused manual. Look for a 50mm f 1.8 DX lens.. There are some good videos on Youtube,, I watched several..
One thing that I got from them was you loose light. Try pulling the LCD screen away from the camera body.. To let air in to cool the back of the camera.. There is limit as to how long you can shoot video..
On April 19, 1995, McVeigh drove the truck to the front of the Alfred P. Murrah Federal Building just as its offices opened for the day. Before arriving, he stopped to light a two-minute fuse. At 09:02, a large explosion destroyed the north half of the building. 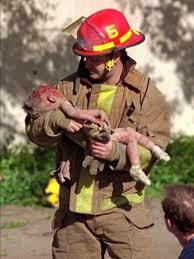 It killed 168 people, including nineteen children in the day care center on the second floor, and injured 684 others. I saw the building on the last day before they brought it down. I watched TV every night to see if they if they found any more people alive. I am 75 and it makes me very sad and heart broken to see the way thinks have changed. I bought a used Nikon D 600 and it had a DEK battery in it..
DEK en-el 15,, 7.4 V,,1900m AH,, 14.1,,Li-ion. I have read about a D 5200 that had a firm ware up date and the D 5200 would not work with a 3rd party battery in the camera, and flashed some mesg. on the LCD screen.. I have read other posts like this.. This is my guess,, Nikon don't make their battery's,,, some one makes them, right ??? I have a friend that use's 3rd party battery's and if one won't charge, they send him another battery.. I have read on the Nikon site,, there is a recall on the battery's en-el 15 with a E or F in the Ser. #. D7200. Nikon battery. Wifi turned off. I will have to check to see if the sleep function is on this camera and/or if it needs to be activated. Thanks. Check your battery to see if there is a ( E or F ) in the Ser. number..
That's all I know,, and I am sticking to it,, lol. Thank God for a second card. If you want to reply to something someone wrote, instead of having to type it all in or cut and paste it... just go to the bottom of their post and hit "Quote Reply". When the reply window opens it will have their post in quotes for you. Just move your cursor to the end and start typing your reply. That should be a LOT easier and quicker. My son in law has a Nikon D 2 X,, it use's CF cards,, He showed me his CF cards,, one was different, he said it was like a little hard drive,, did those not pan out ?? A great example of "watch that background"! The men in Black are Reffs,, right ? ?